I love the feeling of a new year. It just seems to ooze the possibility of a new start, a clean slate, a fresh beginning. Everyone is back on the same playing field. Well, everyone that is just barely starting to get back into the habit of something new, that is. For all of you that have just kept doing what you’ve been doing all along and are now sitting back and laughing at the rest of us struggle to get through a full class at Cardio Barre, you don’t count. And yes, I may be speaking from personal experience. Either way, anything that helps to spark a positive change, is a-ok in my book. I am trying to get back into a healthy workout and eating regimine and really want to get some things organized around my house. I feel like my entire life is in pure choas when things don’t have a set place to go and when I can’t find what I need when I need it. Yep, 2016 is going to be a year of progression for me. Health and wellness progress and organization and home project progress. Are you guys trying to make some changes in your lives this year? If so, what are you trying to accomplish in 2016? 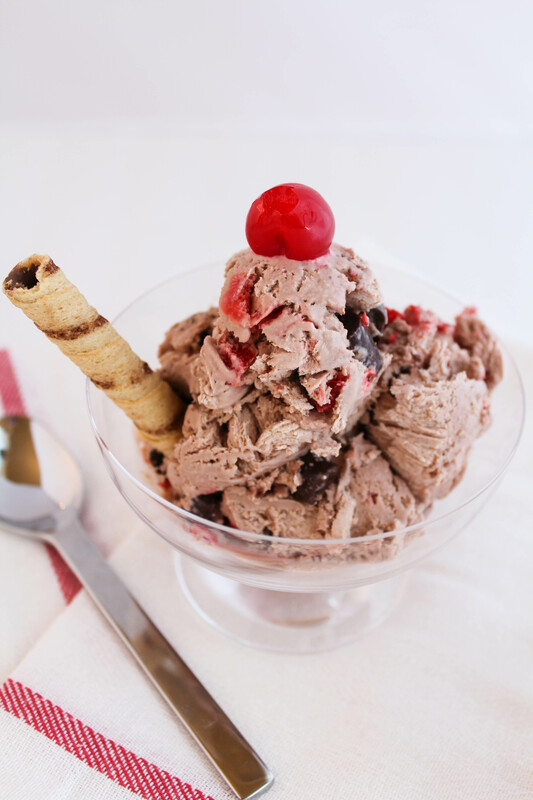 If your goal is to eat more ice cream, then today’s post will totally help you achieve that goal! 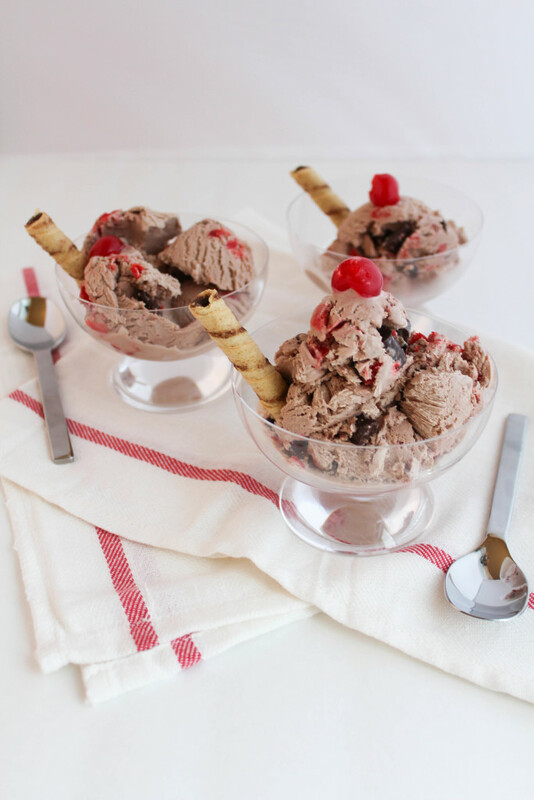 I’m sharing an easy recipe for chocolate cherry ice cream and let me just say, that it really is THAT GOOD. 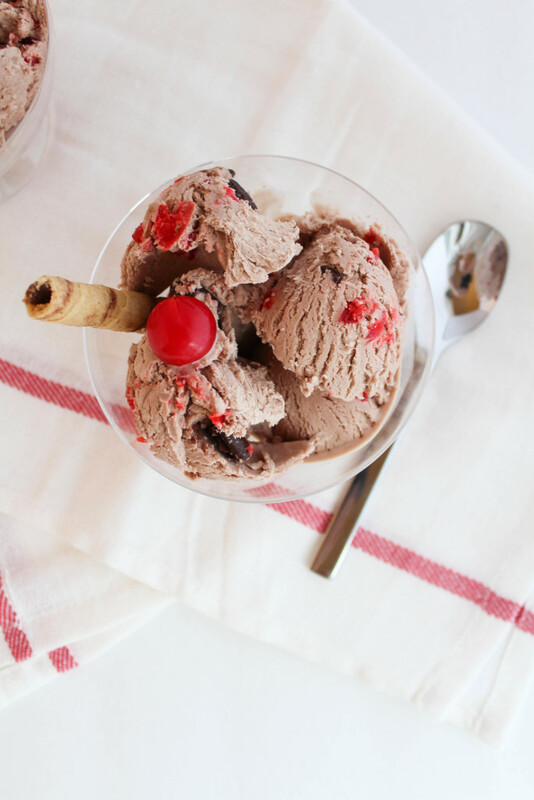 With only 4 ingredients, you’ll have some of the yummiest chocolate cherry ice cream waiting to be devoured in your freezer. 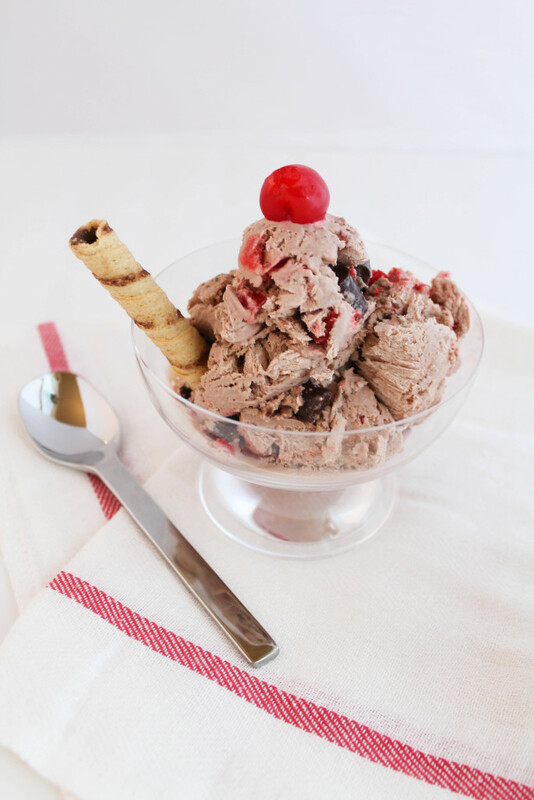 If you didn’t happen to have an ice cream eating goal, and vowed to give up sugar instead…I’m sorry in advance. Add your whipping cream to a medium bowl and, using a hand mixer, whip until thick and heavy peaks have formed. Once your cream is whipped, pour the sweetened condensed milk and the marachino cherry juice into the cream. Begin folding the mixture together until well combined. Add the chocolate morsels and fold into the ice cream mixture until just blended. Pour into an ice cream container, loaf pan, or plastic container. 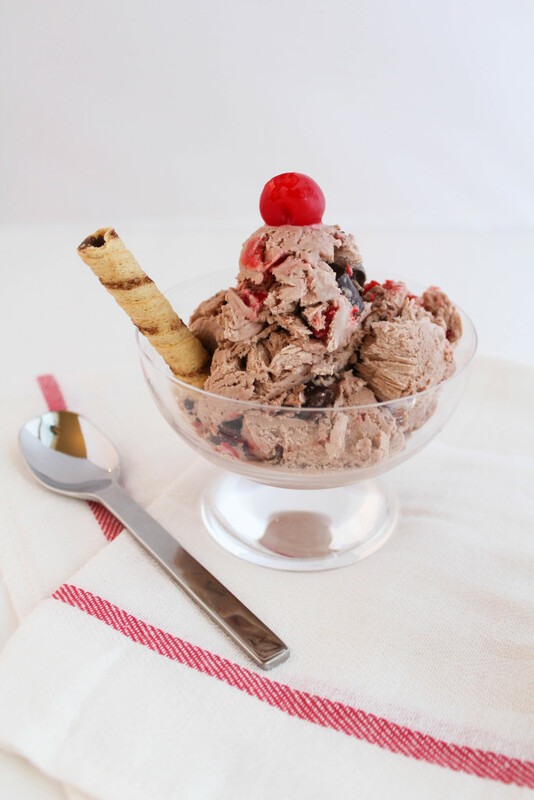 When you are ready to eat, scoop into a bowl and top with a marachino cherry, of course! My dad was obsessed and told me that it was the best ice cream I’ve ever made, but then again, he’s pretty biased. 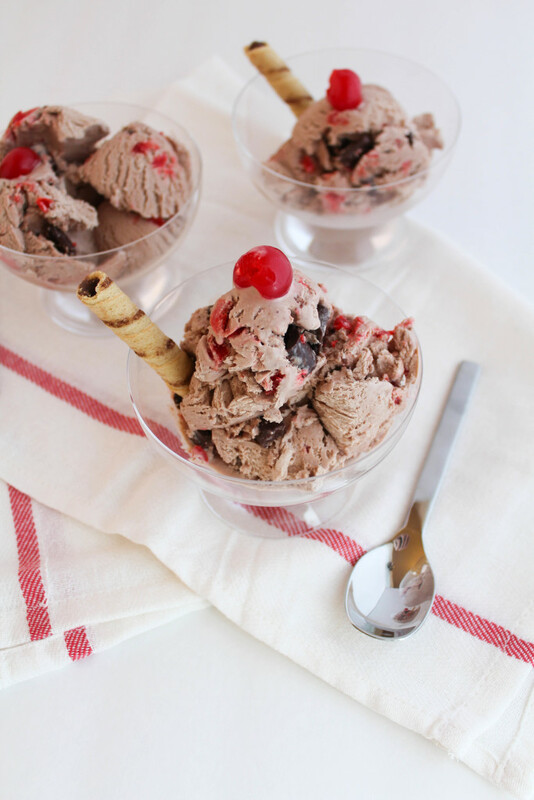 Why don’t you guys make this chocolate cherry ice cream for yourselves and let me know if it ranks up there among your favorites!